Nobody denies that there are problems with anti-Semitism and other forms of bigotry within the Labour Party. Given that anti-Semitism and other forms of bigotry are shockingly commonplace in wider society, any organisation of the size of the Labour Party is bound to have a few horrible people kicking around. The problem is the way the mainstream media insist on presenting the anti-Semitism debate as if it's a Labour-specific problem that's getting worse under Jeremy Corbyn, when the actual evidence shows that anti-Semitic views are very much more common from Conservatives, and that rates of anti-Semitism have actually fallen dramatically amongst Labour supporters since Jeremy Corbyn became leader in 2015. Comparison of two YouGov surveys in 2015 and 2017 shows that rates of anti-Semitism amongst Labour supporters has fallen dramatically, while the same polls show that anti-Semitism rates amongst Tory supporters is barely falling at all. Tory supporters are almost twice as likely to agree with this anti-Semitic trope as Labour supporters, yet the mainstream press insist on portraying the anti-Semitism furore as if it's a Labour-specific problem. The same pattern occurs across all of the other anti-Semitic statements in the two YouGov polls. The rate of agreement amongst Labour voters has fallen dramatically since Corbyn took over, while the rate of agreement amongst Tories is both much higher than the Labour rate, and falling much more slowly. 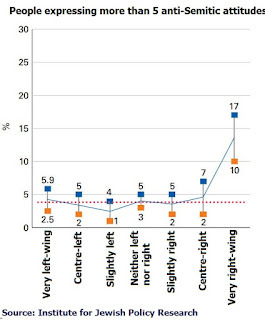 Then there's the research from the Campaign Against AntiSemitism that found that the prevalence of anti-Semitic views amongst Labour and Lib-Dem supporters is much lower than the general public, but that the prevalence of anti-Semitic views amongst Tories is higher than the public at large, and even actually higher than the average for Brexit voters! Of course Labour needs to fight against anti-Semitic views amongst its members and supporters, but anyone who tries to make out that anti-Semitism is a Labour-specific problem when rates of anti-Semitism are loads higher, and falling much more slowly in the Tory ranks is clearly weaponising allegations of anti-Semitism for party political purposes. Of course it's a still a problem that any Labour supporters agree with anti-Semitic tropes, but the reality of the situation is that they're significantly less likely to than the general public, while Tories are significantly more likely to. 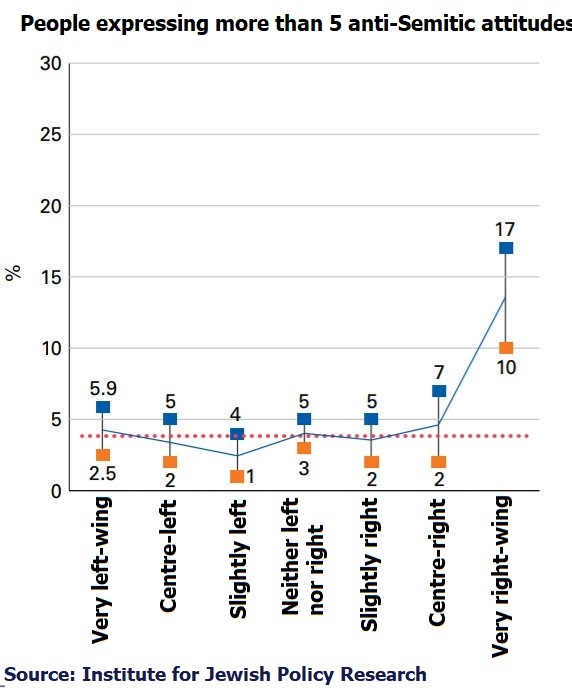 Then there's the study from the Institute for Jewish Policy Research that found that rates of anti-Semitism are way higher on the right of politics than on the left (see image). The fact is that the hard-right are the most anti-Semitic demographic of all, and the Tories have been openly and brazenly courting these hard-right ultranationalist blue-kippers ever since the Brexit vote and the collapse of Ukip. It's absolutely astounding to see a political party that's intent on courting the most bigoted demographic of all suddenly pretending to be concerned about anti-Semitism. If the Tories were really bothered about anti-Semitism they'd clean their own house first, and they'd definitely stop welcoming so many bigoted blue-kippers with open arms. 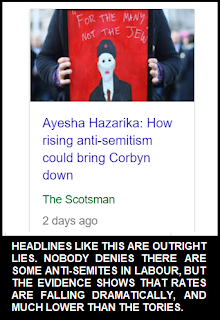 Given the evidence is clear that that rates of anti-Semitism are much higher amongst Tories and the political right, the effort to present anti-Semitism as if it's a Labour-specific problem is clearly dishonest journalism. But plenty of mainstream media sources have gone much further than dishonesty, by wandering off into the realm of outright lies. 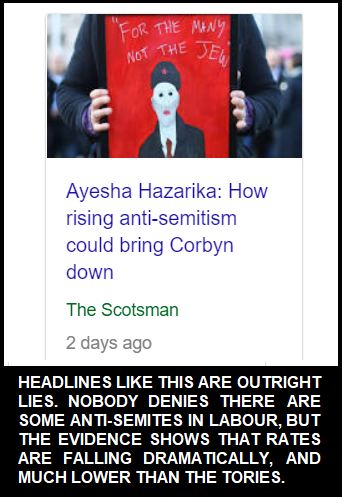 Take the Scotsman's claim that "rising anti-Semitism could bring Corbyn down". Not only is anti-Semitism actually falling, but it's falling much faster under Jeremy Corbyn than it is under Theresa May. The problem of course is that the truth is largely irrelevant to a vast numbers of mainstream media hacks, who continually attack anyone who threatens the neoliberal orthodoxy because they're not really journalists at all, they're simply stenographers for the right-wing establishment. The reason the anti-Semitism issue has arisen again, just before the local elections, is that it's a highly effective wedge strategy to attack the political left with. The blind eye that's been turned to numerous Tory bigotry scandals over the same time frame as the anti-Semitism furore stands as proof that most Tories don't give the faintest damn about bigotry amongst their own ranks, but they know that people on the liberal-left do give a damn, which is why they're using the issue to attack Labour. 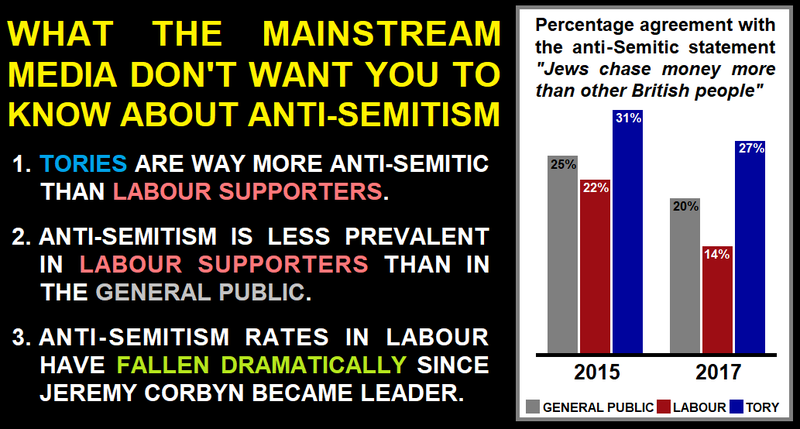 The effort to smear Labour as the party of anti-Semitism (when their own party is actually much worse) isn't really designed to pinch Labour voters and turn them into Tory voters. A person would have to be politically insane to abandon Labour over bigotry and defect to a party with the raving bigot Boris Johnson as their Foreign Secretary! The anti-Semitism furore is all about causing disillusion amongst the liberal-left in the hope that they won't turn out to vote at the local elections. Just remember that a significant proportion of mainstream media hacks are Orwellian illusion-artists. They don't give the faintest damn about rampant bigotry in the Tory ranks, and they don't give a damn that anti-Semitism is actually much higher amongst Tories than it is amongst Labour supporters. All they caren about is using anti-Semitism to attack Labour, because they've completely lost the political argument so weaponising the fight against racism is pretty much all they've got left. The whole illusion crumbles when you look at the actual facts on anti-Semitism. The whole illusion crumbles if you look at the way the mainstream press have completely ignored multiple outrageous Tory bigotry scandals over the same time frame as the anti-Semitism furore. The whole illusion crumbles when you witness non-Jews using this anti-Semitism furore as an excuse to attack and abuse left-wing Jewish people as "anti-Semites". The whole illusion crumbles if you look at the fact that the Labour anti-Semitism march was attended by a bunch of sectarian bigots from the DUP and the racist "Chingford skinhead" Norman Tebbit. UKIP has not collapsed ,it’s purpose and main goal was achieved by its leader ,to get a vote on leaving the EU. It achieved its ambition admirabley ,then of course the compound set of self serving individuals we used to call MP,s ,remember them,they used to act for the people decided that the people were uneducated morons who had no idea what they were voting for.Well Bugger!! I was one of those,plebs or something like that,someone who never ever thought that British MP,s could act like Lord Haw Haw,traitors to their own people ,giving away our great country to a bunch of unelected plonkers for their own self financial gratifications. These people should and I am afraid most likely will be held to account. UKIP or independent none political MP,s will rule our country,we need people with management skills not politicians ,we need a new breed of non greedy folks who have the ability to organise a piss up in a brewery,because this bunch of has been greedy avaricious nobodies cannot. Yes I want out ,yes I voted labour at the last election,the first time in fifty years ,and NO!!! I will not vote for any of the parties that now represent Britain ever again. So we will operate under WTO rules instead. Perhaps you could let us know who the ELECTED leaders of the WTO are?